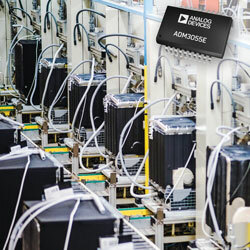 Meeting the need for speed, functionality, isolation, and energy systems, performance in industrial and building automation, and defence/aero networks, Analog Devices extended its transceiver product line for controller area networks with flexible data-rate (CAN FD). The galvanically isolated iCoupler digital isolation ADM3055E IC series not only satisfies but surpasses the industry standard of 5Mbps, offering 12Mbps performance to support future needs, yet remaining fully backwards compatible with existing CAN and CAN FD designs. The reinforced device also has a new, low radiated emissions isoPower isolated DC-DC converter as well as enhanced robustness, providing easier design-in and quicker time-to-market for CAN nodes with full-safety isolation. With the next-generation CAN FD series, designers can achieve increased data rates and longer cable lengths due to low loop delays (150ns max) and extended common-mode range. An integrated isolated DC-DC converter removes the need to provide a separate power source for the isolated bus side. This blend of high level of integration, ease of obtaining emissions and ESD certifications, and the availability of integrated, isolated power enables designers to reduce development cost, PC-board footprint, and overall solution size, while evading the constraints of existing isolated products and approaches. Versions with lower isolation ratings will be offered soon.